Students in WPI’s Psychological Science program examine the mind from various viewpoints to understand how people think and behave in different situations. Students learn about and engage in scientific research in classrooms and with faculty mentors in their research laboratories. The program’s interdisciplinary and global approach allows students to work closely with each other and faculty in a collaborative and encouraging atmosphere. Psychological Science is an excellent choice as a stand-alone major, second major, or minor. Whether a student’s interests are in psychology or a combination of psychology and another discipline (like computer science, biology, or robotics), the faculty helps make those connections so students have a fulfilling academic path. The program’s graduates go on to careers in their area of interest such as health care, law, marketing, human resources, project management, engineering, or nonprofit work. Graduates also pursue advanced degrees in psychology, education, social work, behavioral genetics, health care, and law. WPI’s research-intensive Psychological Sciences program gives students opportunities to work collaboratively with faculty and small teams to complete projects. Students and faculty from across disciplines share their knowledge and insights on projects that address real issues with lasting impact. A research-first approach puts undergraduate students at the forefront of learning in WPI’s Psychological Sciences program. Hear from students who have had transformative hands-on experience in the lab and around the world. 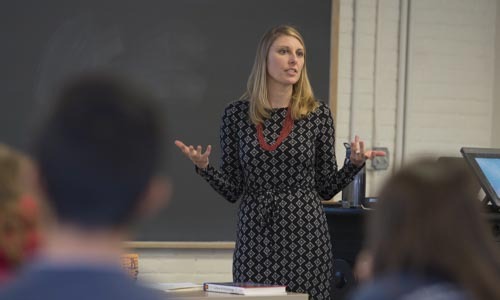 Jeanine Skorinko, director of WPI’s Psychological Sciences program, shares her thoughts on psychological science, the potential the field holds, and her work to expand WPI's research-based program. She also relates how her background led her to WPI and the excitement generated by the research being done in the program's Social Psychology Inquiry Lab. Graduates with a psychology degree face encouraging job prospects in an expanding job market. WPI’s psychology grads have a distinct advantage with the hands-on, scientific research experience they get as an undergrad here. Our students move on to careers in everything from research to private practice to human resources, law, or marketing.